BravoPysanka.com - Your Easter Holiday site for your needs! 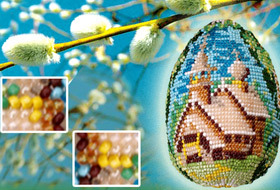 Buy Easter Egg gifts, Ukrainian Pysanky, Easter pictures, Easter videos, Easter books, and more. 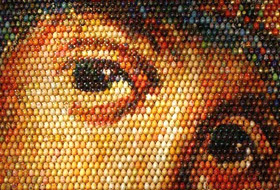 Pysanky could assist in regaining lost love, enhance friendships and even increase the fertility of childless couples. The mysterious world of Pysanka! 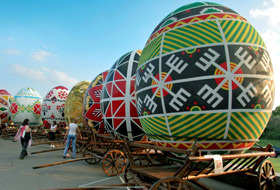 Among Ukrainians there is a belief that the fate of the world depends upon pysanky. As long as egg decorating continues, the world will exist. 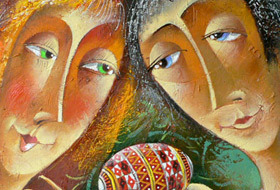 Ukrainian Easter Eggs became popular all over the world because of their exquisite artistic beauty. It is believed that Pysanky possessmagic powers, as they protect the owners from evil and bring wishes of prosperity, good health, happiness, and hope for a brighter future. Depending upon their motifs and colors, Pysanky could assist in regaining lost love, enhance friendships and even increase the fertility of childless couples. 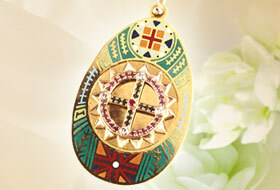 Designed by Canadian artist Ann Morash, the coin captures the beauty of a pysanka. 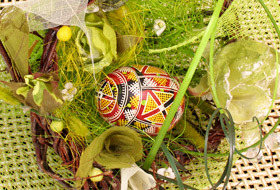 Every element on this Ukrainian Easter egg is rich with symbolic meaning, including the individual colours: yellow stands for youth and purity; red represents the joy and passion in life; green is the colour of spring, which brings hope and renewal; and black suggests the darkest time before dawn. 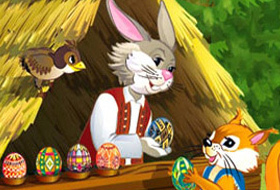 We are really proud to present the new amazing story book for kids: Pysanka-Easter Egg. The story has both Ukrainian and English version and will guide you to the world of Pysanka. Vegreville, Canada is the site of the largest Easter egg in the world. 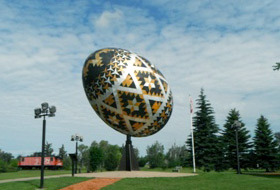 The Easter egg or Ukrainian 'Pysanka,' was constructed in 1975 to commemorate early Ukrainian settlements in an area east of Edmonton. in Kolomyia, Ivano-Frankivska Oblast, Ukraine. Yuri Macik was born in 1956 in UKRAINE and now lives in Moscow. The artist uses a method of composition, based on the construction of an artistic image of associatively linked fragments of reality. His works are in private collections in many countries including Canada and Ukraine. We are really proud to present the new amazing coloring book for kids: Symbolic Pysanka. Coloring Book is made for Kids 6+ and written in Ukrainian language. 13 eggs are in black and white ready to color them. Book has 27 pages. Spend time with your kids and travel to the magic world of Pysanka. Marvellous mosaic work depicting the Virgin Mary on a wall of the Saint Sophia cathedral in Kiev made by Ukrainian artist Oksana Mas. 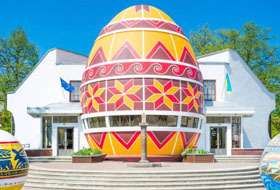 The panel was made with 15,000 wooden Easter eggs Pysanky painted in traditional Ukrainian style. 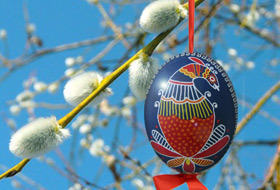 Pysanka - Easter Egg is an inseparable part of the Easter celebration and big component of the Ukrainian history. 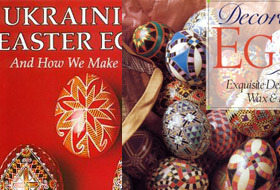 There are many books have been written about the Pysanka: fairytales, master classes, photo albums. In Ukraine post card were mostly used on major Christian holidays such as Christmas and Easter. Eggs, malyovankas (painted eggs), geometric motifs and vegetable egg ornaments reflected on many postcards. 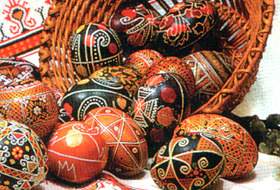 A photo slide shows the wooden Easter Eggs (Pysanky) painted by brush. 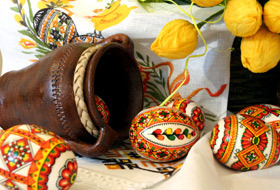 "Malyovankas" or painted wooden eggs are decorative eggs, painted with oil paints and "huashovymy" using a thin brush. only in Ukraine but also in Europe. 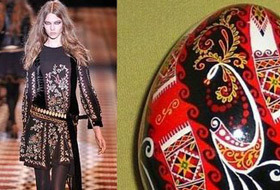 While Gucci's fall '08 collection may have conjured up visions of a hippy-chic revival, the combination of folk textiles, detailed handwork, and "Babushka" tapestries brought to mind Pysanka -- traditional Ukrainian Easter eggs decorated using a wax-resist 'batik' method. Pictures of Easter eggs are never random and arbitrary. Each of them has its purpose, its meaning, transmitted from generation to generation and basically does not change. Pysanka is a symbolic trinity: the symbolism of eggs, ornamentation and color. Happy Easter Song sung in several languages including English, French, Italian and German. Send this song to your family and friends with best wishes of Happy Easter. Bravo Pysanka brings you the best Easter gifts for you and your family for the holiday season. If you never heard about Easter egg Pysanka, now, you can see online at www.YouTube.com! Browse for user name "MsPysanka", which already has 82 videos uploaded. You can watch, learn, vote and share links with friends and family. Copyright © Ukrwest LTD 2005-2013. All rights reserved.